Posted on 30, September 2016 by EuropaWire PR Editors | This entry was posted in Education, France, Science, Technology and tagged Dr. Srinivas Kaveri, His Excellency Mr. Alexandre Ziegler, IIT Delhi-CNRS PhD fellowship programme, Indian Institute of Technology, Mr. Antoine Caput, Prof. V. Ramgopal Rao, Thales. Bookmark the permalink. New Delhi, 30-Sep-2016 — /EuropaWire/ — Thales and Indian Institute of Technology, Delhi (IIT Delhi) today signed a Memorandum of Understanding (MoU) to create a jointly supervised IIT Delhi-CNRS PhD fellowship programme. 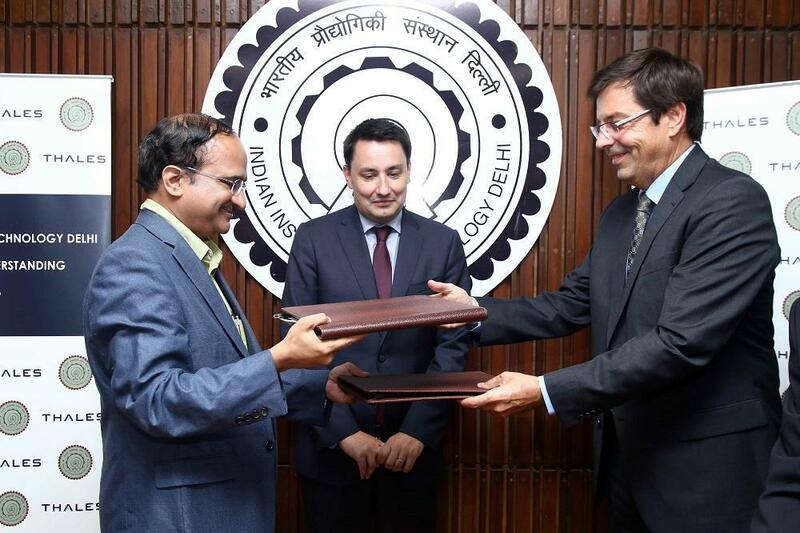 The MoU was signed in the presence of His Excellency Mr. Alexandre Ziegler, Ambassador of France to India. By partnering with world-leading universities, Thales seeks to foster innovation and develop an ecosystem for scientific and industrial research. In India, Thales has formed similar partnerships with the Indian Institute of Science, Bangalore and the Indian Institute of Technology, Bombay in October 2015 and January 2016 respectively. Indian Institute of Technology Delhi is a public research university located in Delhi, India. It was declared to be an Institute of National Importance by Government of India under Institutes of Technology Act. IIT Delhi is among the top two technical Institutes in India which have been listed in Quacquarelli Symonds’ (QS) list of top 200 universities globally in 2015. – To participate in the analysis of the national and international scientific climate and its potential for evolution in order to develop a national policy. As the largest fundamental research organisation in Europe, CNRS carried out research in all fields of knowledge, through its ten institutes.